The solution is based on a TI-RTOS gateway. 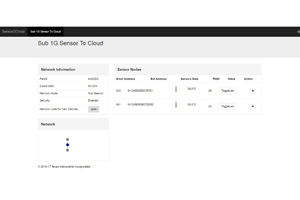 There is also a Linux-based Sensor to Cloud solution available. 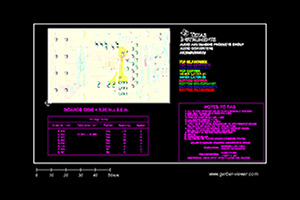 Learn more about the Linux-based solution. 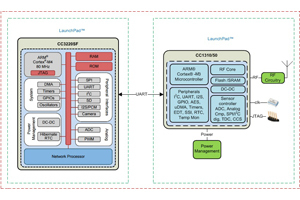 This design provides a complete end-to-end solution for creating a Sub-1 GHz sensor network with an Internet of Things (IoT) gateway solution and cloud connectivity. The gateway solution is based on the low-power, SimpleLink Wi-Fi® CC3220 wireless microcontroller (MCU), which hosts the gateway application and the SimpleLink Sub-1 GHz CC1312R/CC1310 or the multi-band CC1352R/CC1350 wireless MCU as the MAC-CO Processor. The reference design also includes sensor node example applications running on the SimpleLink Sub-1 GHz CC1312R/CC1310 and multi-band CC1352R/CC1350 wireless MCUs. This design pre-integrates the TI 15.4-stack software which is supported as part of the SimpleLink CC13x2 and CC13x0 software development kit (SDK) providing a complete Sub-1 GHz star networking solution. How fast can you connect? Get started with the kit now.